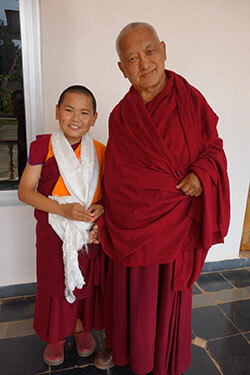 Lama Zopa Rinpoche with Phuntsok Rinpoche at Ganden Monastery, India for His Holiness’ Jangchup Lamrim teachings, December 2014. Get FPMT News Blogs Delivered by Email! CKSL Affiliates and Becomes Center! 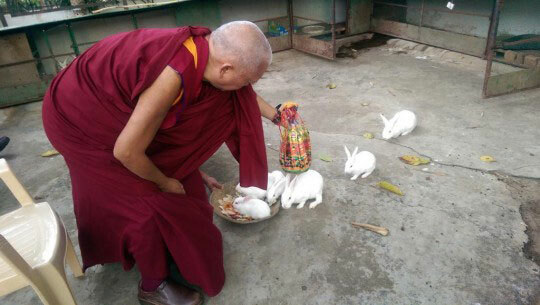 Lama Zopa Rinpoche blesses rabbits at Osel Labrang, Sera Je Monastery, India, December 2014. In early 2014, Lama Zopa Rinpoche, via the Lama Zopa Rinpoche Bodhichitta Fund, offered approximately US$16,000 to Maitreya Project Kushinagar to be used toward the incredible humanitarian work they are now undertaking …. Read more and see our invitation to rejoice in all FPMT Charitable Projects below! 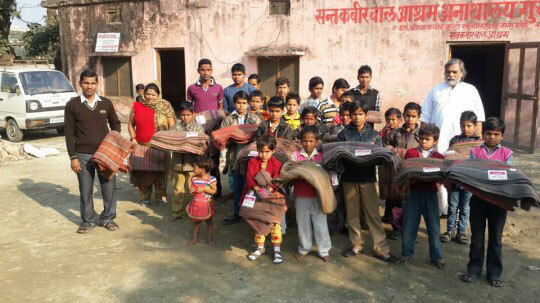 Blankets were offered to 30 children in a local Kushinagar orphanage by Maitreya Project Kushinagar, India. Find a wide range of advice from Lama Zopa Rinpoche on Rinpoche’s Advice page. Go to the Lama Yeshe Wisdom Archive for lots more advice from Lama Zopa Rinpoche. Keep up to date with Lama Zopa Rinpoche News. More in 2015 – details soon to be announced! 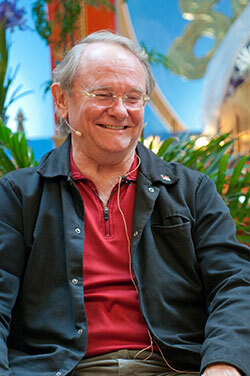 Teachings in New Zealand in May; Russia in early July; teachings and retreat in Mexico, Colombia and Brazil in September. Please check Rinpoche’s schedule online or subscribe to our FPMT news blog to get updates as soon as they are available. Please contact the hosts directly with any questions regarding the event. Rinpoche Available Now – Enjoy livestreams and recordings of Rinpoche’s most recent teachings! It’s time for your Merit Box practice to benefit virtuous projects all over the world! Send in your accumulated offerings anytime from now until March 31 and you’ll provide funds to be used for the 2015 Merit Box grant awards! Want to start doing Merit Box practice? Click here. 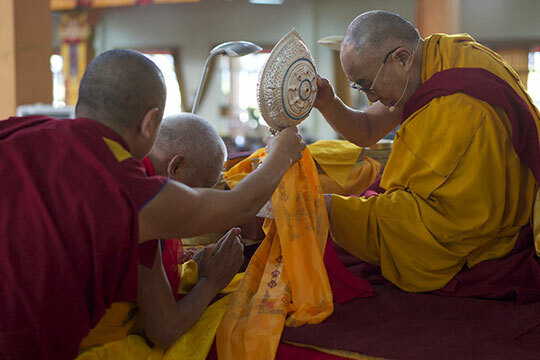 Lama Zopa Rinpoche offering a silver Dharmachakra to His Holiness the Dalai Lama during the Jangchup Lamrim teachings at Ganden Monastery, India, December 2014. Please take a moment to rejoice in all the incredible and beneficial work happening within FPMT Charitable Projects. There is so much to rejoice in and the ongoing news and updates from all the projects show the extensive reach of this work. Thank you to all the kind donors who enable FPMT to be able to support all these amazing projects. Prostrations to the 35 Confession Buddhas is now available as a standalone PDF. Practices to Benefit Pretas, Nagas and Spirits has been updated and is now available as a downloadable PDF. Practicing the Five Powers Near the Time of Death is now available for free as part of our growing collection of death and dying resources. Professor Jeffrey Hopkins, Maitripa College, Portland, Oregon, United States, September 2011. As part of Mandala‘s expanding online presence, we are offering a new online feature each month. Our inaugural piece is an interview with Professor Jeffrey Hopkins, a senior American student and highly respected scholar, translator and editor. In this interview, conducted by Maitripa College student Donna Lynn Brown, Hopkins discusses the topic of honesty. Get free access to FPMT education programs, have Mandala magazine delivered to your door or e-reader, and support the global efforts to fulfill the mission of FPMT all at once! Join Friends of FPMT today. 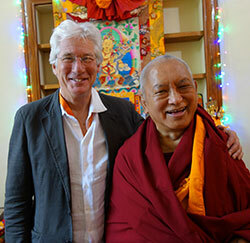 Lama Zopa Rinpoche and Richard Gere after lunch together on Christmas Day during the teachings of His Holiness at Ganden Monastery, India, December 25, 2014. An excerpt from a letter from Rinpoche thanking a benefactor of an FPMT center. Rinpoche has said that you can give his letter to those who are generous to the center, project or service, and through their generosity, are bringing sentient beings to enlightenment. Find the full letter with other advice from Rinpoche and Lama specifically for FPMT centers, projects and services. A reminder that FPMT Education Services is now responsible for FPMT registered teachers applications and support. Center Services is continuing to handle the appointment of and questions regarding resident teachers and geshes. If you are unclear what this change means for you, please contact Tom Truty. A reminder to all FPMT centers that we are happy to include your retreats on our Retreat Schedule webpage! For Discovering Buddhism and Basic Program retreats, contact Education Services. For all other retreats (minimum of four days or longer), contact Center Services. Choe Khor Sum Ling (CKSL), Bangalore, India recently affiliated with FPMT Inc. and successfully made the transition from a study group (a probationary center, project or service) to an FPMT center! This means that there are now 119 FPMT centers, projects and services and 38 study groups in 37 countries. Lama Yeshe Wisdom Archive has shared a report of its activities in 2014 and plans for the future – lots to rejoice about! Please check out the regularly updated meritorious opportunities to offer service as a volunteer or as paid staff in FPMT centers, projects and services around the world! Land of Calm Abiding, USA, urgently needs a caretaker (position could suit a couple); Maitripa College, USA is looking for a development consultant; Milarepa Center, USA, is looking for a spiritual program coordinator (SPC) and for a center manager; the Foundation for Developing Compassion and Wisdom, UK is looking for a 16 Guidelines program manager. Right understanding is the only solution to both physical and mental problems. You should always check very carefully how you’re expending your energy: will it make you happy or not? That’s a big responsibility, don’t you think? It’s your choice: the path of wisdom or the path of ignorance.